One of the biggest contributing factors that most people are not aware of is that the main reason they are tired, overwhelmed, not creating consistent income, over-marketing, and no one is hearing them, is because they are in desperate need of soul alignment! If you are attracting the wrong ideal clients who drain you and leave you feeling undervalued, plus you are working hard to please them, it's because your messaging is not grabbing the right clients who just get you. Soul alignment brings you clarity to your messaging because every action you take from your super power is going to speak directly to the souls of your audience. So, it's essential that the specific words and meanings in your sales pages, marketing, website, business pages, Facebook profile, and other social media need to be aligned to your super power. This communicates to your audience who you are, what you do, how you help them, what you stand for and why you do what you do, while being totally authentic. Every super power contains the energy that allows people to align to your soul, which is called your “soul's purpose gift.” That specific aligned energy is what people gain in order to like and trust you, and help them to build their confidence in your work. Chances are you are not aligned if you're not getting results, because there are specific words that your soul expresses that takes some remembrance which you have spent years not aligning to. You find yourself speaking from your life challenges (the results and skills that your super power brings to the people you serve) words along with using words from mainstream marketing that aren’t fully aligned to your purpose and soul. This is why it’s essential to know your super power and soul marketing power words. I noticed that my clients were still having problems with their messaging, even though they received their soul alignment blueprints. They were unable to speak, write and market to their ideal clients because they were using their life challenges words. 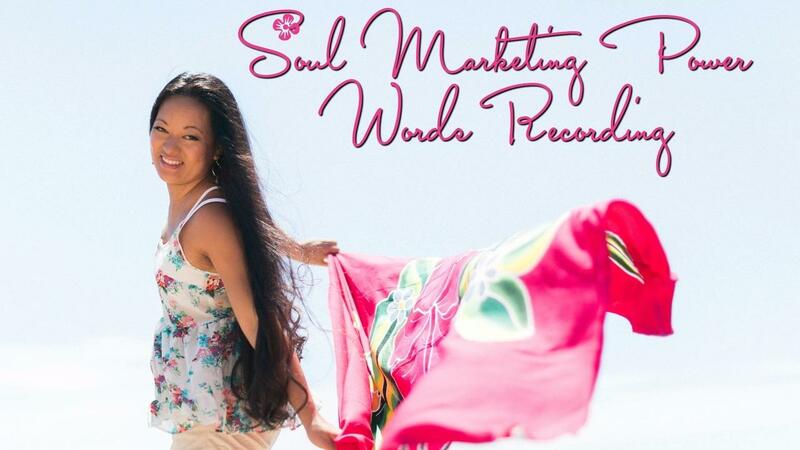 Therefore, I created the recording of the "soul marketing power words" according to the 8 kinds of super powers, so that they could speak directly to their ideal clients and market themselves better! An explanation recording that explains to you how to use your specific power words from your specific soul alignment blueprints. Explanations that show you how to speak directly to the soul of your ideal clients and channel the specific words that move your prospects to take action to buy from you. Instructions on how to use your soul alignment blueprints as a guide to effectively display your super powers to your audience so you are "relatable" to them (your gifts have the answer to their problems). Instructions on how to effectively market yourself aligned to your super power. A second recording gives specific words that are only aligned to your super power and shares the answer to your level of freedom. An explanation of your specific questions that you can ask in your strategy or discovery call sessions to find their real pain so you can effectively close the sale. Please note: These words are for your own personal and business use that you will need to re-frame according to your own unique perspective and your super power. This is NOT a quick fix! It takes time to be able to start speaking from your super power instead of your life challenges. In addition, you will need to do your market research to figure out all the mindset work, client avatar, messaging and business strategy to convert your clients to become good revolving ideal clients who continuously buy from you. You will need to do the work to speak and write differently, but this is a guide that will prevent miscommunication and drama in your life and business. Get this amazing recording set for just $497 now! Due to the fact that the clearings, attunements, and intuitive guidance are life changing and priceless, there are no refunds. The program itself is designed to teach you how to use your "soul alignment blueprints," even if you don't understand how to use this now or in the coming months or years. It may take a long period of time before you understand more how this soul aligned manifestation method works. There are also no guarantees that you will have any specific results or manifestations during the time frame of the program. It's all about doing the work and experimenting that will yield your results. When you join, you will also allow Leimomi to collect any testimonials or use your stories of awakening that she deems as necessary use for the betterment of this program or for future help in your manifestations in the program. All material from Leimomi Keliikuli, Inc. is copyrighted and you shall not have the rights to use these in your business offers or personal related endeavors. This material in the program is strictly for your own personal use and spiritual development. They are prohibited from being copied or distributed. If you have opted for a paid monthly subscription to this program, you are by law in agreement to finish your payments even after the program has finished. If your monthly subscription fails at any time, you will be contacted to make the completion of your payment to update your subscription. If the failed payment is not paid within 10 days of the initial due date, you will be revoked access to the materials immediately and your subscription will be suspended until full payment is made. Your subscription will then be subject to cancellation at Leimomi Keliikuli, Inc.'s discretion and no pro-rated payments will be accepted or refunds given. By making your payment on this platform, you are agreeing to these terms and conditions. Thank you!